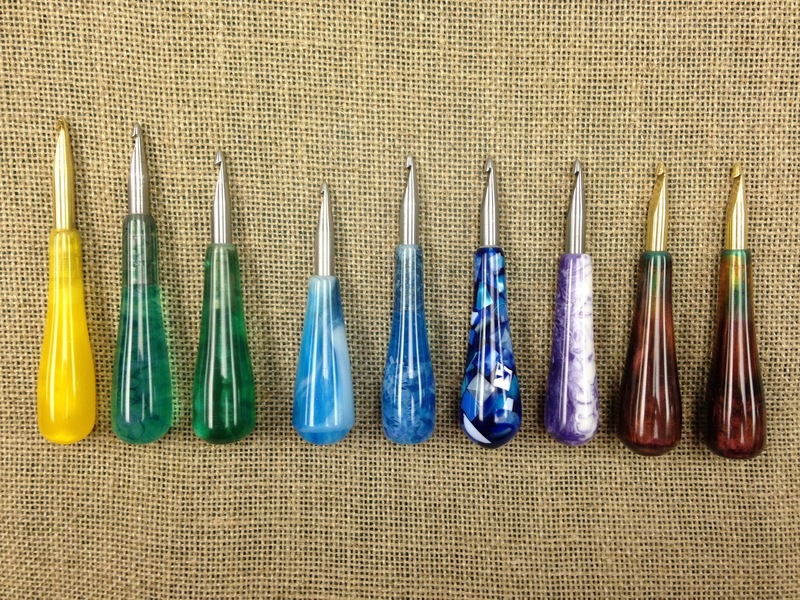 These beautiful acrylic 8mm hooks are one-of-a-kind and made exclusively for Spruce Ridge Studios. The hook shaft is custom-milled of brass or steel and is 8mm in diameter. Suitable for #8 cuts and wider. The wider shaft pokes a bigger hole in your foundation, making it easier to pull up textures and wide cut strips. Add a little fun to your hooking with the gorgeous depth and colors of these hooks! Handles are approximately 3.5″ long. Currently in stock: Lemon Yellow, Translucent Green, Lucky Green, Sky Blue, Caribbean Seas (sold), Blue Cubes (sold), Purple Haze sold, Bronze Beauty x 2.